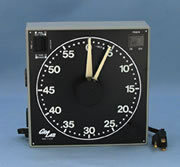 A new improved Model 300 Darkroom Timer. Shows minutes and seconds in total darkness. The 60-minute time range can be set in minutes for developing and seconds for enlarging control. Two hands permit quick setting by seconds, minutes, or combinations of seconds and minutes. Two separate outlet receptacles control an enlarger or printer and safelight by a combination time/focus switch. Each outlet has a 750-watts capacity. This model also can be used with a relay for heavier loads. Easy to read numerals on a large 6½" diameter face. Luminated by phosphor fluorescence. Input voltage: 100 to 130 VAC, 50 or 60 Hz (U.S. and Canada); 210 to 250 VAC, 50 or 60 Hz for use in other countries. OA / greenish yellow – For black-and-white contact and duplicating materials and projection films. Available in 5½", 3¼ x 4¾", 5 x 7", 8 x 10" and 10 x 12". OC / light amber – For contact and enlarging papers. Available in 5½" dia. and 3¼ x 4¾". 1 / red – For some blue-sensitive materials, most phototypesetting materials, KODAGRAPH Projection, and some KODAK LINAGRAPH Papers. Available in 5½" dia. and 5 x 7". 1A / light red – For slow orthochromatic materials. KODALITH and KODAGRAPH Orthochromatic Materials, and High Resolution Plates. Available in 5 x 7" and 10 x 12". 2 / dark red – For fast orthochromatic materials, some green-sensitive x-ray films, KODAK EKTALINE Papers, and KODAK orthochromatic LINAGRAPH Papers. Available in 8 x 10" and 10 x 12". 3 / dark green – For some panchromatic materials. Available in 5½" dia. and 8 x 10". 13 / amber – For all KODAK EKTACOLOR*, all KODAK PANALURE, and KODAK RESISTO Rapid Pan Papers. Available in 5½" dia., 8 x 10" and 10 x 12". GBX-2 – For all blue- and most green-sensitive medical and dental x-ray films. Available in 3¼ x 4¾". Filter Type 5½" 3¼ x 4¾" 5 x 7" 8 x 10" 10 x 12"
For viewing and editing slides, transparencies, negatives, micrographs, etc. They also serve as a base for orientation of embedding specimens when observing tissues using a magnifier. Scientifically designed to provide even distribution and uniformity of light. All metal welded construction with a white baked-enamel finish. The viewing surface is a translucent acrylic that is break resistant. It can be used flat on a table, inclined, standing, or hung on the wall. It comes with a ANSI standard 5000K fluorescent lamp, 10 feet cord, on-off switch. It is compact and can be used on a desk. Small enough to carry in a briefcase or store in a drawer. Weight 4.5 lbs. It is portable and has a vinyl cover and a heavy duty strap handle. 5000K fluorescent lamp. Weight: 11 lbs. 16" x 48" or 24" x 36". Please call for prices. Very thin - only ½" thick (14 mm). Modern technology provides extremely even, bright illumination. 8"x10" viewing surface , with two 5400 K color corrected lamps with 20,000 hour life. The unit can be used flat on a table, standing at an incline, or hung on a wall. The Light Pad is also designed to display photo transparencies held under a clear plastic panel. Fits in a briefcase or stores in a desk drawer. It is powered by a 12V, DC adapter. The overall size is 12¼" x 9¼" x ½". Weight: 2 lbs. Sorting and viewing 2 x 2" slides easily and quickly is made possible with this slide sorter unit. All metal frame; Its baked white enamel finish reflects light for perfect viewing of slides. Translucent styrene viewing panel. Folds flat for storage. Uses standard 60-watt household bulbs (Bulb not included).